Love the tats in contrast with the old school car. What a great juxtaposition! I thought the same at first. But now that i am looking at it, I think this is the hottest picture. Its far less theatrical, and more authentic. Also more manly. He looks modern, and yet he looks like a young JFK. THIS is my favorite. But at first I agreed with andrea completely. Look again. You never know. I am continuously amazed by these wonderful moody shots from Vegas… Cool, man. Perfect shot! I love his expression. Peeerfect pic. I love all from LV. 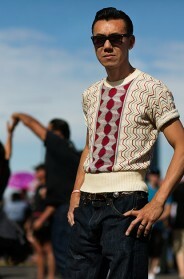 Gorgeous classic mens look with a twist, love it. Really enjoying these posts! I love to think all these wonderful looking people dress this way in every day life, so well put together and well groomed and also natural and easy looking; (as opposed to the , overthought, overwrought confections from the recent shows…). I was the lady in the photo just before this one and I am pleased to tell you that most of us who attend Viva Las Vegas Rockabilly Weekend do dress like this on a daily basis! Thanks Jessica! I thought so too, it looks so stylish, but does it not take a lot of time and effeort with all the make up and skirts and heels and stuff..? Anyway, he looks wonderful too. Stylish guy really. 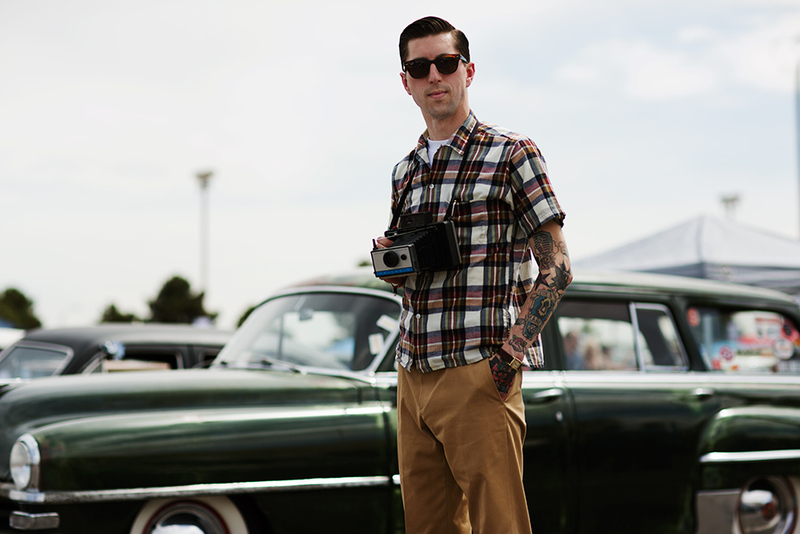 Love the tatoos and the vintage camera! I love the camera too but I don’t think film is available anymore for it. Nice prop. The film for these cameras is actually making a recent comeback. The company is called Impossible Project. It’s not a prop, I did actually have film in the camera, but it is tough to find. I shot much of the car show and pool party in color and b/w with that camera. I get the film from a shop that specializes in instant photography. For me this is all about his camera! Cool guy and love the camera! Simple look but he nails it. It’s all about the hair. Tattoos give a nice mix, too. All the LV pics have been great. This kind of thing can easily be costumey, and I’m sure there were people there who fell into that category, but the subjects you selected all struck the perfect balance. Polaroid Land camera! You can still get film for this camera. Check the Film Photography Project for more info :) A great prop for his vintage look. I’m such a sucker for a man dressed like this! Classic and forever manly. Ummm…. where is this again? Vegas? I AM ON MY WAY!! His camera is so cool. Ugh…the cliche trendiness of using a Polaroid. Trendy or not, the photos look great, and it’s a lot cooler to see the film develop before your eyes than to crowd around a digital camera screen. I have a dozen or so of Polaroids from all periods I’ve used, but I went a different direction once it became trendy. I love men’s hair in the 50′s. I miss the clean, shaven look and well fixed hair. Punk rock rebel looking to photograph the perfect girl? Perfect setting to complement this lad’s outfit. this shot looks like time travel. i love how the sleeve is the only real giveaway that this picture was shot in 2013 and not 1953. Wow, this man is stunning! I love all these shots from VLV. I’d love to go one day! The man, the hair and the camera! Fierce. That guy definitely cut me in line in Starbucks yesterday. I love vintage car Show. I missed this show. 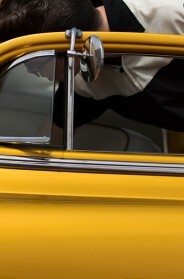 I had been to las vegas shows like Cirque de soilel and Comedy shows , band shows etc but never to vintage car shows. The film used in that camera is the earlier pull a part instant film. Its easy to find. Fuji makes it. It’s called FP100C. Timeless look, good photo.